The median price had been below half a million dollars since October last year, which had some analysts surmising costs had hit an affordability wall. But, the March numbers show some buyers are willing to go higher to get homes. 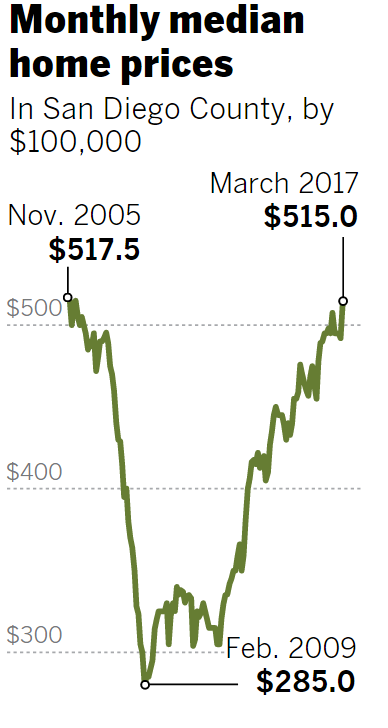 While the new price might seem historically high, it is still below the nominal 2005 peak of $517,500, the equivalent of $644,487 in 2016 dollars after adjusting for inflation. Analysts say a lack of available homes for sale is probably the biggest factor in March’s numbers, but there are other reasons, too. San Diego’s market mirrored a trend in March of increased sales and rising prices in California. In the six-county Southern California region, 22,042 homes sold — its highest number for March since 2007. A jump in sales between February and March is common as most buyers and sellers take the holidays off. This was the biggest increase in sales between the months, 48 percent, in 12 years. Likely because of low inventory, home sales across Southern California in March were 7.1 percent below the average 23,732 sales since 1988. Andrew LePage, research analyst with CoreLogic, said in his report that heavy winter rains could have delayed sales at the start of the year, and a strong stock market and job growth could be fueling the latest sales. “It’s also possible that some people moved up their 2017 purchase plans because they feared mortgage rates would keep rising,” LePage wrote. The March resale home median price in San Diego County was $550,000 with 2,274 sales, and the resale condo price was $390,000 with 1,122 sales. In a year, the house price increased 4.8 percent and 8.3 percent for condos. The newly-built home price in March was $646,500, increasing 2 percent in a year, with 302 sales. Cash buyers made up 20 percent of sales in March, the same as this time last year. The peak was 37 percent in February 2013. Absentee buyers, usually investors who don’t intend to live in their purchases, bought 19.8 percent of homes in March — down 1.4 percentage points from the same time last year. In early 2013, more than 30 percent of sales went to absentee buyers. Southern California’s median home price was up 7.1 percent year-over-year across the region for a median of $480,000. The biggest increase was in San Bernardino County, at 12.1 percent to a median price of $305,000. It was followed by Los Angeles County with an 8.5 percent increase for a median of $549,000; Ventura County with an 8.4 percent increase for a median of $538,500; San Diego County with the 7.7 percent increase; Riverside County with a 7 percent increase for a median of $352,955; and Orange County with a 6.4 percent increase for a median of $665,000. There are indications San Diego County’s market could be heading for a busy summer buying season, said another report released Tuesday. The S&P CoreLogic Case-Shiller Indices, which track repeat sales of identical single-family houses as they turn over through the years, showed a strong San Diego market in February. Seattle had the biggest increase at 12.2 percent and New York the least at 3.2 percent. Even though a strong buying season is expected this spring, many analysts, including Goldman, say the market is not heading for a housing bubble because the last crash was built on riskier loans. Prices are rising this time because of lack of inventory and there are stricter standards to get a mortgage. With fewer homes for sale, buyers will have to fight for properties this summer. Real estate agent Miguel Torres Diaz said he recently sold a two-bedroom, one bath townhouse in Spring Valley in three days after getting seven offers. He ended up selling the 1,008-square-foot home for $240,000, $10,000 over asking price. “Anything below $350,000 is like a feeding frenzy out there,” he said.